Reconsider forwarding that funny email, video, or unproven story. It will have your name on it. Yes, all posters were shipped last week and most everyone should have received their posters by now or shortly. Thank you again to everyone for supporting this project! Look for more MEMO RANDOMS products in the future! POSTER PRINTING UPDATE: Posters are drying! For all the Kickstarter backers who ordered posters, we are excited to let you know that the posters have all been printed and are drying now - in preparation for packing and shipping. We're planning to get everything packed up this weekend and in the mail early next week! They will be on their way to your walls shortly! Thanks for the interview and recognition! 049 :: EVERY MEETING REQUIRES A LEADER TO ESTABLISH THE CONTEXT. A leader will explain to all attendees WHY they are together, WHAT the goal is and, WHEN they are finished. 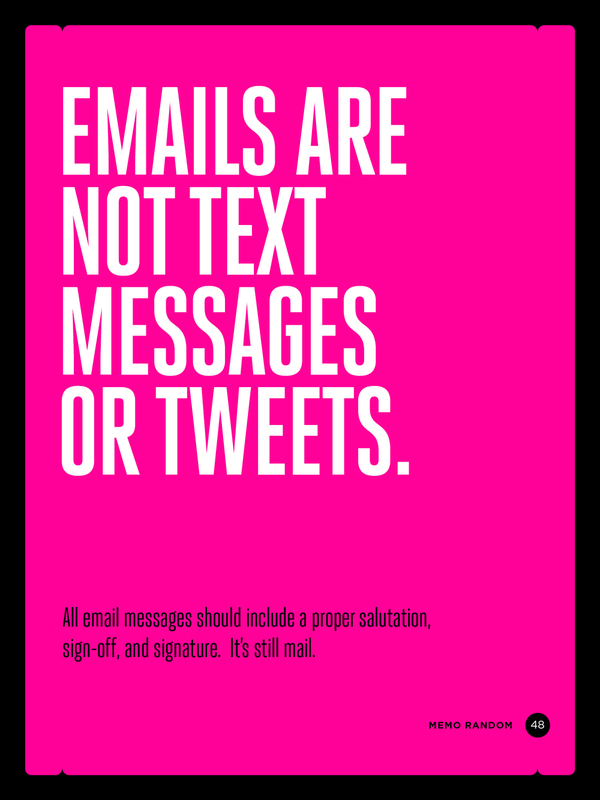 048 :: EMAILS ARE NOT TEXT MESSAGES OR TWEETS. All email messages should include a proper salutation, sign-off, and signature. It's still mail. KICKSTARTER UPDATE: Posters into production soon! 047 :: ORGANIZE FILES WHEN YOU HAVE TIME TO SPARE. This small investment will give you the greatest return when you have no time in the future. 046 :: EMAIL IS NOT A VERB. EMAIL IS A TOOL. When you find yourself "doing" email, it's time to reevaluate how you are using the tool. 500% FUNDED! WE DID DID DID DID DID IT! Our Kickstarter campaign ends in 2 days...then it's time to start printing & shipping! 045 :: NEVER USE THE SAME PA55WORD TWICE. Passwords leak. The more places you use them, the deeper under water you can get. 044 :: REAL PEOPLE DESERVE 42x THE ATTENTION OF VIRTUAL ONES. Never prioritize your digital communication above your real-world communication. If you're appreciated in the Netherlands, it's all gravy after that! I'm going to go ahead and assume they are saying nice things over at LIFEHACKING.nl! 043 :: NEVER ATTEND A MEETING WITHOUT A MEANS OF TAKING NOTES. Take a pen & paper. Take it down. Take responsibility. 042 :: YOUR BIRTHDAY IS NOT A COMPANY HOLIDAY. Cake? Yes. Singing? Maybe. Blow the day off? No. 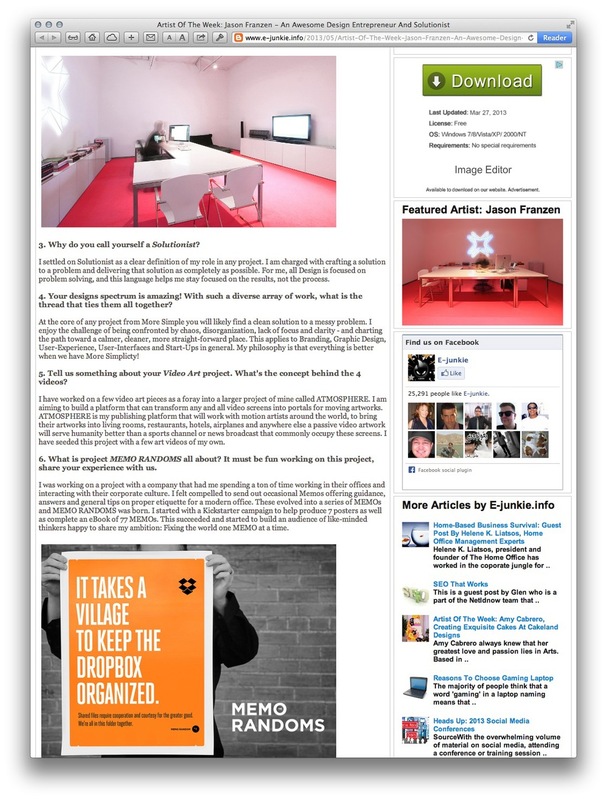 MEMOs were included in the premier issue of UC.QUARTERLY - a print publication from the cool folks at Under Consideration. 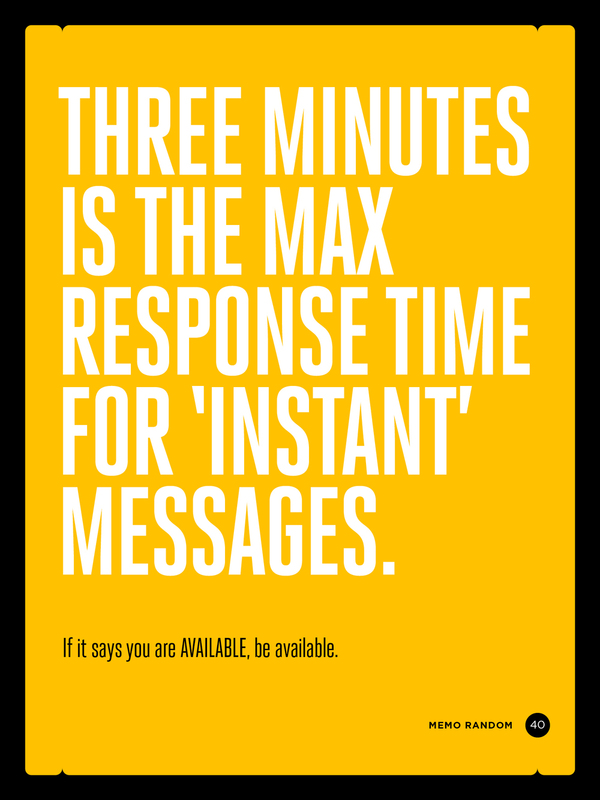 040 :: THREE MINUTES IS THE MAX RESPONSE TIME FOR 'INSTANT' MESSAGES. If it says you are AVAILABLE, be available. 039 :: YOU MUST ANSWER OR ACKNOWLEDGE EVERY POINT IN AN EMAIL. Answering one point does not close the conversation.